LafargeHolcim has revealed its upgraded cement plant in Ada, Oklahoma, US, after a three-year modernisation project that focused on the construction of a new kiln line. The plant is the second modernisation to be unveiled by the company, following the opening of its modernised Hagerstown plant last year. “By modernising the plant, we have transformed it into an efficient, competitive, and state-of-the-art facility that will allow us to meet the growing needs of our customers, and remain a strong partners to the community for the foreseeable future,” said John Stull, CEO US Cement at Lafarge Holcim. The new kiln line at the hundred-year-old plant is designed to meet and exceed emissions limits, improve operations performance, and increase capacity to meet market growth. Plant capacity is expected to increase by 20% to 0.682 million tpy of cement. As part of the focus on the environment, the plant substitutes around 20% of its fuel requirements with scrap tyres that are sourced by LafargeHolcim’s waste management company, Geocycle. “Investing in the environment is critical for the health and long-term viability of the communities where we work, which is why we reuse materials that would normally be sent to landfills,” said Mike Langan, Ada plant manager. Image courtesy of LafargeHolcim. 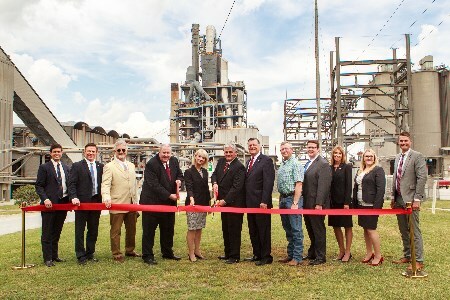 From left to right: Bryson Panas, Office of US Senator Jim Inhofe; Todd Thomsen, Oklahoma State Representative; Guy Sewell, Ada Mayor; John Stull, CEO US Cement, LafargeHolcim; Deby Snodgrass, Oklahoma Secretary of Commerce and Tourism; Mike Langan, Ada Plant Manager, LafargeHolcim; Tom Cole, US Congressman; Gary Starns, Chairman, Pontotoc County Commission; Greg McCortney, Oklahoma State Senator; Monica Neal, Chickasaw Nation; Joy Moon, Chickasaw Nation; Caleb Cochran, Office of US Senator James Lankford.